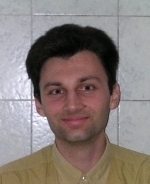 Paolo Adragna is undertaking PhD studies in Experimental Physics at University of Siena. He is currently involved in the ATLAS experiment as one of the developers of the GNAM online monitoring system and, together with the people from INFN in Pisa, is participating to the commissioning phase of the Tile Hadronic Calorimeter. Before joining the ATLAS group in Pisa as a scientific associate, he already worked as a programmer for the CDF II experiment at Fermilab in Batavia and for the VIRGO experiment at LAPP in Annecy-le-Vieux. Paolo Adragna is dottore magistrale in Physical Sciences and graduated from the University of Pisa in 2004 with a thesis on online monitoring and resolution optimisation of the ATLAS Tile Calorimeter.